Yes,Sergey Brin and Anne Wojcicki is matching our funds. So what does that mean? Team Cul de Sac has made 50k this year and it will be matched! So TCDS with the help of Sergey Brin and Anne Wojcicki challenge will have raised over $100,000 for the MJFF!!! Lio and The Buckets pay tribute this weekend to Cul de Sac, which ends today. Thanks to Master Ibid for the tip. As Richard Thompson ends his strip, we'll see more of these articles, but Grand Avenue won with 22 votes. See your vote does matter! You can hear the Team Cul de Sac panel here. Recorders! We all had recorders! Well, actually Carolyn and I did - you can try to put together the panel in stereo now. Richard Thompson, Bill Watterson, Nick Galifianakis and I signed 5 Team Cul de Sac books. For details, email me at teamculdesac@gmail.com. I will not ask Bill Watterson to sign any more TCDS books to raise money for us. I want this to be a very limited opportunity to own a signed book by Mr. Watterson and Mr. Thompson and help us raise money for TCDS. Richard Thompson, the Cul de Sac cartoonist, was diagnosed with Parkinson's disease in 2009 and began working with the Michael J. Fox Foundation to raise awareness of this illness. Chris Sparks organized Team Cul de Sac, which has solicited work from various graphic artists including Bill Watterson and Gary Trudeau, the proceeds of which have benefited Team Fox, the Foundation's fundraising arm. Chris Sparks and Nick Galifianakis speak before the book-signing. I recorded the Team Cul de Sac session and it's online at the Internet Archive. You can download it or listen from the site. "When Richard Thompson, the creator of the comic strip Cul de Sac, was diagnosed with Parkinson's disease, his friend Chris Sparks began a fundraising effort to honor his friend. 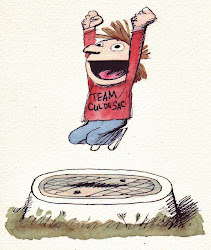 With Richard's support, he asked others to donate artwork featuring the Cul de Sac characters for a Team Cul de Sac book with proceeds going to The Michael J. Fox Foundation For Parkinson's Research. Now, join Chris Sparks and other members of Team Cul de Sac including Steve Conley, Matt Dembicki, SL Gallant, Roger Langridge, and others as they discuss the book, Richard Thompson's work, and their continuing efforts to raise funds in Richard's name." - from the program book. The panel also included Carolyn Belefski, Dawn Griffin, Donna Lewis, Joe Sutliff and was moderated by Mike Rhode. Richard Thompson has won the Harvey Award for the best syndicated comic strip. 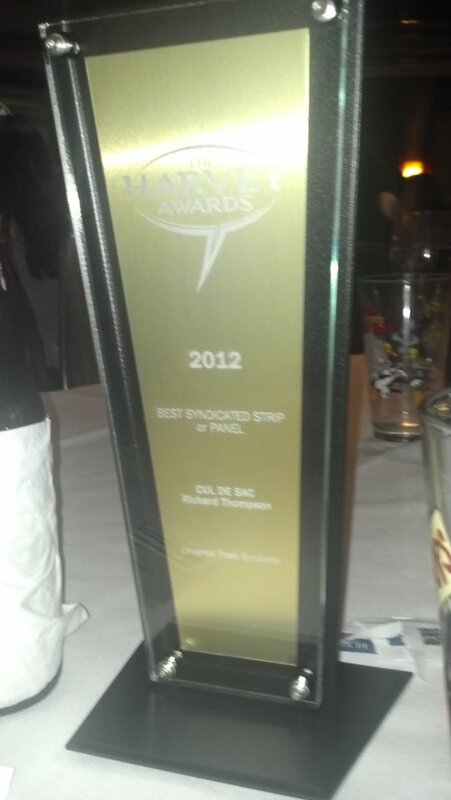 It was presented tonight at the Baltimore Comic Con. 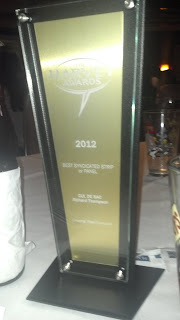 Photo by Chris Sparks who accepted the award on Richard's behalf.